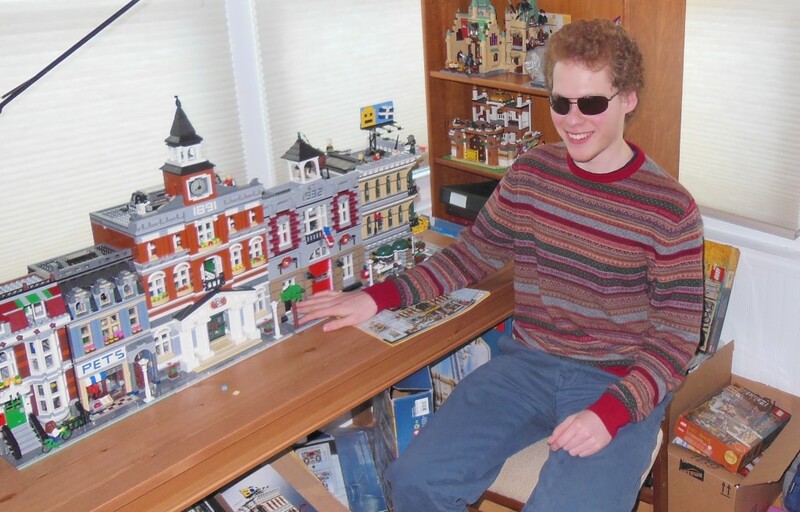 By guest contributor, Matthew Shifrin, a blind LEGO builder. It was the morning of my thirteenth birthday, and I was filled with the usual birthday excitement. I was most eager to see my friend Lilya. That morning she arrived toting a large cardboard box and a binder. The box was labeled, “LEGO Battle of Almut, 841 pieces.” and the binder contained a set of Brailled instructions. The gift caught me totally by surprise. I didn’t think that, as a blind person, I’d ever be able to follow the instructions to build what was pictured on a LEGO box without the help of a sighted person. But I was wrong. My first encounter with LEGO came when I was four years old when my parents bought me a Duplo train. I had great fun rearranging the cars, stacking them, and connecting the people and freight pieces in various ways. My introduction to real LEGO came a year later. One day, Lilya was driving me home from a music lesson when suddenly she pulled over, stopped the car, and got out. A few seconds later she returned with something big and heavy creaking in her arms. I opened the box and reached inside. It was filled to the brim with LEGO pieces. That box on the sidewalk began my love affair with LEGO. I have always enjoyed touching or manipulating things, to get an idea of my surroundings. 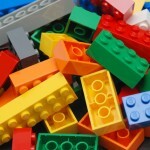 For me, LEGO proved to be the ultimate manipulative. I could sit for hours with a tray of LEGO pieces, sorting them and mixing them together. Above all I loved to build structures that were always new, always original, and always completely my own. However, I knew I was not up to building real LEGO sets by myself. When my dad had free time, we’d sit down and build together. Dad would tell me which piece we needed, and I’d search until I found it. Then he would tell me where it was supposed to go. Little by little a set would take shape. It was a fun process, but it was incredibly time-consuming and since my dad was often busy, sets tended to remain unfinished. Eventually I would take a few Minifigures out of the set and dump the rest into the LEGO bin for building my own creations. As I grew older, I saw more and more of my friends having fun with LEGO. They followed intricate instructions, and built X-wing starfighters and the Hogwarts Castle. Meanwhile, I was left behind with my own imagination. Once in a while my father and I built Bionicles, but we never had time to build a large LEGO set. I drooled over sets like the Green Grocer or Grand Carousel online, never thinking that I’d be able to build them myself. Lilya could make just about anything accessible for the blind. Making things accessible was a challenge she enjoyed, but LEGO was different. It was impossible to Braille the blueprints. The instruction manuals had no words, and they were too complicated to be turned into raised-line drawings. Building a model required so many steps that I couldn’t copy them all. LEGO was the only thing that stubbornly resisted adaptation. Or so I thought. For my thirteenth birthday, Lilya had custom made instructions for the Battle of Alamut, a Middle Eastern domed castle. How had she done it? Where did she find text-based instructions? It turned out that she didn’t find them–she created them! Lilya wrote out the instructions step by step, describing every blueprint, giving names to every kind of LEGO piece, figuring out the most logical sequence for a blind person to follow. She also sorted the LEGO pieces, putting the pieces necessary for each step into a Ziploc bag and labeling each bag in Braille. Finally I was able to do something other kids do all the time! I knew I was too old for LEGO. I was thirteen, and most of my friends had stopped building at nine or ten. But I didn’t care. LEGO is an excellent brain strain. It’s a great way to improve spatial awareness and spatial reasoning–areas where blind people often struggle. Step 1. Put a F 32x16 hor on the table. It is blue and symbolizes the Thames. Step 2. Put a 6x1 with side holes ver on the left edge, in the middle (skipping the front five rows). Step 3. Repeat symm on the right. Step 1. Put a FS 4x2 hor to the left of the PP, in the middle (on the 8th and 9th rows). Step 2. Put a 2x1 slide ver to the left, slide to the right. Step 3. Repeat Steps 1-2 symm on the left. Later sets were easier for Lilya; she realized that she could just type the instructions on the computer and e-mail them to me, and my screen-reader took care of the rest, so there was no need to braille anything. Sometimes though, there were difficulties. Sometimes Lilya made a mistake. More often I claimed she had, and then realized that I had misread her instructions. Some structures were so shaky that I needed another pair of hands to steady them until sections were connected ten steps later. For the life of me I couldn’t figure out how to build a 1930s General Electric refrigerator. My only consolation was that the friend who finally put it together works as a watchmaker for Rolex–and it took him forty minutes! Now, having adapted over 40 LEGO sets, our jargon is clear and concise. 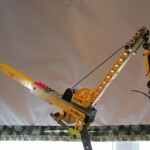 The terms we use are similar to the piece names originally chosen by the LEGO Group. The instructions have grown shorter, and my fingers have grown more nimble. We’ve posted our instructions to legofortheblind.com, and made them free, just like LEGO does with their graphical ones. I find that the most rewarding sets to build are Modular Buildings, which are minifigure-scale houses, shops, and fire stations. The buildings are realistic, and include tons of interior details– couches, coffee makers, and working elevators are all built from LEGO. As I build a set, I develop a better sense of what a building looks like and how it is laid out and constructed. 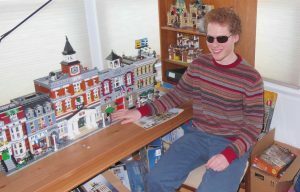 LEGO sets let blind people touch the untouchable, enabling them to experience the arches of a Middle-eastern palace or the towers of the Tower Bridge the same way that sighted people learn about the world by looking at photographs. I would like to get my instructions out to the blind kids and their parents. I would like for every blind person to be able to download the instructions, buy a set, have a sighted person sort the pieces, and then put it together feeling on par with a sighted builder. I want every blind person to feel that the once impossible is now possible; that they can now build a miniature LEGO world. If you’d like to get in touch with me, email me at matshifrin@aol.com. 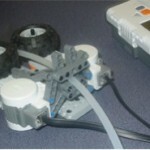 To see our LEGO instructions in action, check out this video. You can find more and download text-based LEGO building instructions at legofortheblind.com.